Recently, I went with a friend to Greenfield Village, one of Michigan’s historical treasures. Originally opened in 1933, the Village consists of more than 80 historic structures on a site laid out like a New England community, complete with a village green, farmhouses, workshops, shops, a railroad depot, and a bandstand. The Village also includes homes and workplaces of famous innovators: the Wright Brothers’ home and bicycle shop and Ford’s first automobile assembly plant. One of the most interesting is the reconstruction of Edison’s Menlo Park laboratory complex, where he created some of his most famous inventions. 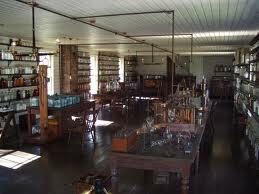 I’ve been to Greenfield Village and Edison’s laboratory many times, but this time one detail struck me. 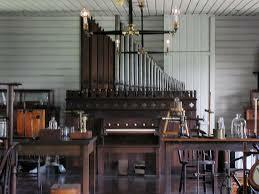 On the second floor of Edison’s laboratory is a pipe organ, used for impromptu sing-alongs during long work days and nights. For years I’ve heard stories of Edison as a strict taskmaster, with multiple teams working at the goal of achieving at least one small invention every ten days. So sing-alongs? Organ music? And yet, it fits. Traditionally, the words “all business” indicated an atmosphere that is far from the playfulness we associate with creativity. But for many businesses, innovation is essential to their success. Google is famous both for innovation, and for their playful workspaces. 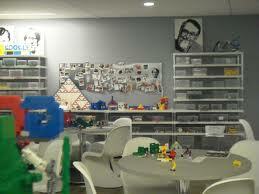 Whether Lego labs in New York or a slide to the cafeteria in Tel Aviv, Google offices celebrate the creative spirit. And there is good reason. Amabile and her colleagues examined the relationship between the emotional environment at work and creativity. They found that positive feelings about the work environment are related to increased creativity; when employees have positive feelings about their work environment, they are more likely to have creative ideas. But the relationship also works in reverse–when employees have creative ideas at work, they feel more positive. It is interesting to think about the possible implications of this business research for schools and classrooms. In schools, time is a precious commodity. We cannot afford to waste time in activities that don’t substantially contribute to significant learning. But, we must be careful about trying to create classrooms that are “all business,” especially now that we understand a stark or negative atmosphere isn’t effective in business, either. There is a time for students to learn about organization, respect, and care. But this research tells us that a positive atmosphere—a place people want to be—makes a difference in their creative thinking. If we want to have students engage with content in multiple ways—to think creatively and flexibly—we must create spaces in which such things are possible. Think about your classroom. Are there places for playfulness? Are there moments for imagination? What would Edison think? How can you create a classroom that has more space for innovation?